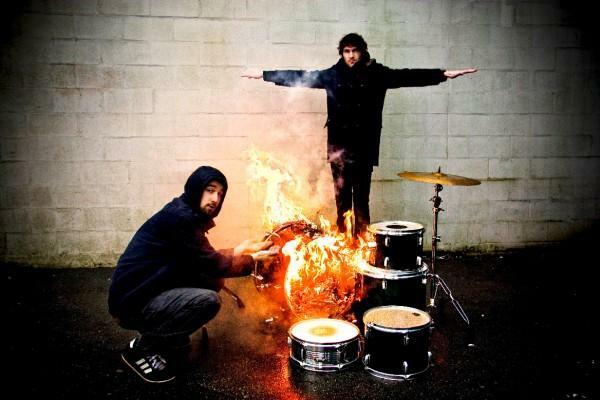 Following on from their current tour of Asia and Australia, on top of touring the world throughout 2012 in support of the much-lauded album Celebration Rock, Vancouver duo Japandroids will be returning to the UK and Europe for a full tour supporting punk rockers The Gaslight Anthem. The tour kicks off on the 21st March at Bristol Academy, taking in two dates at London's Troxy at the end of the month before blazing onto Europe in April. Read on for tour dates. Japandroids released their long awaited follow-up to their critically acclaimed 2009 debut Post-Nothing, Celebration Rock, in summer 2012 in the UK. The album was produced by Jesse Gander at Hive Creative Labs and Japandroids and has been called "one of the year's most thrilling rock records" by Rolling Stone. International critics have unanimously agreed with that, as evidenced below by glowing reviews on Drowned in Sound and Stereogum. The album was shortlisted for the prestigious Polaris Prize in Canada and received many album of the year plaudits including Rolling Stone Top 10 Albums of the Year. Plus Japandroids were crowned Band Of The Year by SPIN and House That Heaven Built was voted no 1 Song of 2012 by Paste. See exactly why audiences all over the globe love Japandroids' inciendiary live show through this Pitchfork Music Festival clip of 'Fire's Highway'. Watch Japandroids' first music video for their single 'The House That Heaven Built'. The video finds director Jim Larson traveling with the band on their summer US tour, filming their sold out shows in Toronto, Montreal, Boston, NYC, Brooklyn, DC and the band's life on the road in between.